It’s such a common phrase referring to something easy to pick up or remember, but is clearly used only by those who have never dabbled in the world of downhill mountain biking. As a casual Midwest biker, I’m definitely at novice status out here in Utah where mountain biking is a way of life. 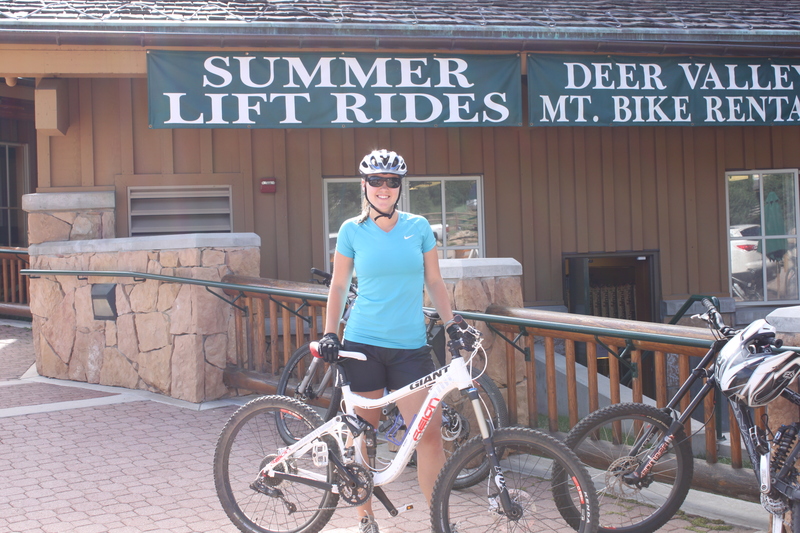 In my first summer as a Park City local, I decided I needed to dive right into that outdoorsy lifestyle. 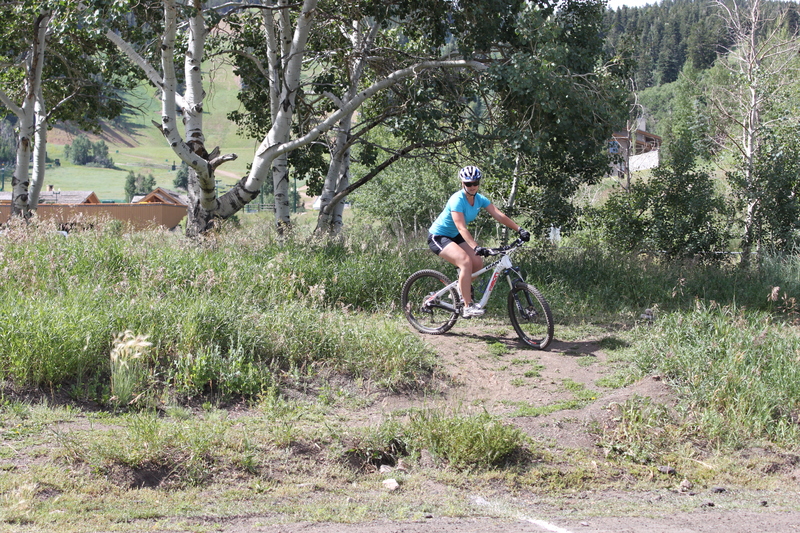 However, instead of jumping on a bike, saying a prayer, and heading down the mountain, I thought it best to take a lesson from a professional to learn how it’s supposed to be done. My three hour lesson at Deer Valley’s Mountain Biking School began from the earliest stages of getting to know my bike. I rented a full-suspension bike that allows for six inches of vertical movement while riding which was definitely a new feeling compared to the stiff hard-tail I’m used to. We started in the parking lot to get familiar with the gears, brakes, and feel of the bike before taking on some basic dips and switchback techniques. It sounds easy enough, but after falling twice (in the parking lot, mind you) I’d say my pride was a little wounded. I wasn’t used to handling turns while standing up out of the saddle or actually needing to use my front brake (which would soon become my downfall). While the tips and techniques seemed like common sense, the mastery of them was going to take a lot more mental toughness than I imagined. After completing a few turns without any falls, we took the Silver Lake Express and Sterling Express chairlifts to the top of Bald Mountain. I wasn’t sure how much actual terrain or elevation I’d be seeing as a beginner, but after my instructor said we were going to the top and my deer-in-the-headlights look finally wore off, I was ready. 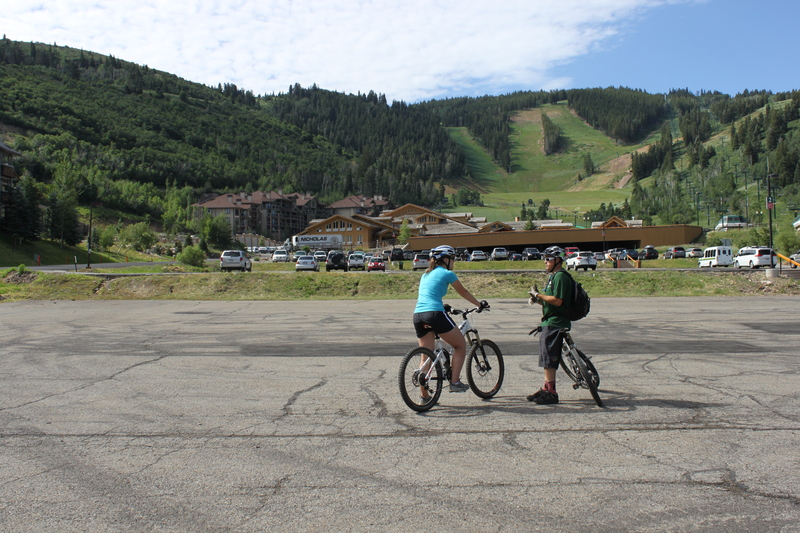 My instructor, Jeff, went over the basics with me one more time before we headed down the mountain. Keep my feet parallel in platform position, keep my weight up and back, and look out ahead to where I want to go and not as much at the rocks in front of me that I want to avoid. He was also really great about preparing me for what to expect on the trail ahead. The first section had three switchback turns. The first two went well. The third did not. Instead of looking out ahead of me and continuously braking through the turn, I decided to panic, look down, and throw on my front brake harder than necessary. Over the handlebars I went in a Superman-like fashion. Another useful tip I thankfully took from Jeff? Wear gloves. When you fall, your hands are often the first point of contact with the ground. We were pretty early into the trail so I knew I didn’t have time to worry about how dirty I was, where I was bleeding, or who was watching. “Alright, let’s go! We’ve gotta get down the mountain, right?” Jeff made sure I was okay and took caution before we started moving again which was really comforting for my first ride. The next sections of the trail included more cross-country terrain where I could work on speed control and find a rhythm for handling the switchbacks. There were times I could sneak a peek at the unbelievable setting of sagebrush and aspen trees through which we were weaving, but I usually left sight appreciation time for when we were stopped, for my safety as well as everyone else’s on the trail. As we approached the bottom of the hill, Jeff reminded me to stay focused on the last few turns since it’s easy to be distracted by the base instead of maintaining control through the end of the trail. I managed to finish the ride upright on my bike and still in one piece. I can’t thank Jeff enough for his patience with me and, more importantly, for teaching me to have patience with myself. When I realized this was not “just like riding a bike,” I had to cut myself some slack. Downhill mountain biking is like nothing I’ve ever done before. Sure I acquired some scrapes and bruises, but I see it as a bit of a rite of passage into the mountain biking world. After learning the proper techniques, each ride feels a little more comfortable, the scenery a little more beautiful, and falling, which may be inevitable for me, is a little less scary. 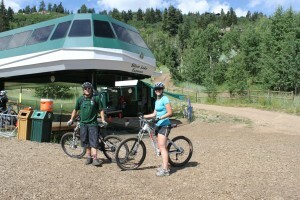 Amy is the communications coordinator at the Park City Chamber and Visitors Bureau. 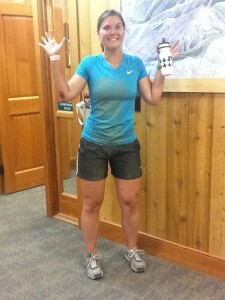 Amy is originally from Lowell, Indiana and moved to Park City in the fall of 2010. 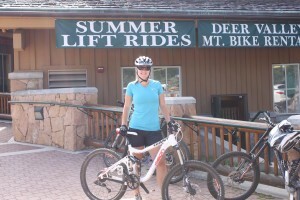 When Amy is not mastering her mountain bike skills she can be found playing sand volleyball, practicing yoga, or browsing the shelves at Dolly’s Bookstore.